With Millstreet International Horse Show CSI2* well underway, the countdown to next week’s Millstreet International Horse Trials continues and The Duggan Family and the Organising Committee are delighted to announce that the feature Millstreet CICO3* FEI Eventing Nations Cup™ will be presented by Connolly’s RED MILLS. Now in its fourth year, the 2018 Horse Trials in Millstreet take place just days after the traditional CSI2* International Horse Show that has been a keystone in the Irish equestrian calendar for nearly forty years. 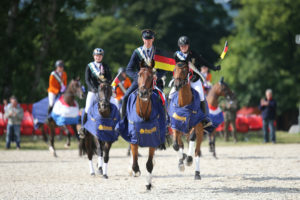 Having previously hosted a variety of FEI European underage championships for Young Riders, Juniors and Ponies in the disciplines of Eventing, dressage and jumping, the Green Glens Arena and the adjoining Drishane Castle Demesne will host it’s first senior level team competition with some of the world’s best known event riders heading to Co. Cork. The FEI Eventing Nations Cup™ series got underway in Italy in April and has since taken in venues in Great Britain, Poland, the USA and France. Millstreet forms the penultimate stage before the final in Boekelo (NED) this October and after 5 legs, a strong team from France will travel to Ireland hoping to further extend their lead at the top of the overall standings. Victories at Vairano (Italy), Strzegom (Poland) and their home leg in Le Pin au Haras give the French team a ten point advantage over Great Britain while a win on home soil next weekend would move Ireland up to sixth place in the current rankings. The 2020 Tokyo Olympic Games will feature a restructured Eventing Team competition and the Millstreet Nations Cup class will act as an official Test Event for the new format; teams will comprise three members with an opportunity introduced to make substitutions during the competition. Mike Etherington-Smith (GBR) returns to design the Cross Country courses at all levels and the recent dry weather conditions have been met with a renewed focus on watering and agrivation of the ground to ensure the best possible grass cover and going for the Cross Country phase. The dressage and show-jumping phases will take place on the newly resurfaced all-weather arenas at the Green Glens Arena. 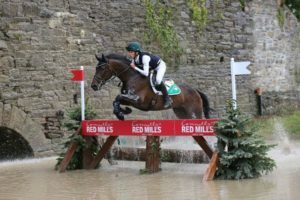 Connolly’s RED MILLS have been long standing supporters of equestrian sport in Ireland through their sponsorship of initiatives including the show-jumping Spring Tour and the Connolly’s RED MILLS Eventing SuperLeague to name but a few. Speaking about the partnership, Event Director Thomas Duggan said, ‘We are delighted that Connolly’s RED MILLS are continuing to support all of our equestrian events in the Green Glens Arena, including this prestigious leg of the FEI Eventing Nations Cup™.